“Fishing is all I know,” says Asif Baloch, who has been earning his living through fishing for the last 25 years. His two young sons accompany him while he takes his boat into the Arabian Sea off the eastern coast of Gwadar. For hundreds of years, Gwadar has been a natural sea port and fishing has been a vital source of food and income for the local residents. Now faced with an uncertain future, the fishing communities fear losing their livelihood and the possibility of being relocated out of Gwadar city. In Pakistan, Gwadar is the heart of China-Pakistan Economic Corridor (CPEC) a flagship project of China’s Belt and Road Initiative (BRI). But Gwadar has been in the headlines long before it was part of CPEC. In early 2000s after a deep-sea port was first constructed here, this natural port town got huge international attention. During the first phase of port development, some old fishing neighborhoods that gave way to the port construction were relocated to a new neighborhood in the outskirts of the city. Today, however, it is not only the fishermen’s homes but also their livelihood that is in jeopardy. Since last October, following the beginning of construction work on the East Bay Expressway, local fishermen have protested for their right to their livelihood. The recent wave of protests and sit-in strikes by the local fishermen are very telling of how the fantasies of Gwadar’s development are already threatening the indigenous population. This is not the first time these communities have been affected and therefore they are more skeptical this time than ever before. The ambitious 19-kilometer six lane expressway will provide a direct link for cargo traffic to and from Gwadar port, connecting it to the Makran Coastal Highway. But it will block up to 4.3 kilometers of the coastline, affecting all the fishing communities living in this part of the city without any prior consultation. Since the expressway will limit access to the sea for fishing boats, it will also threaten their centuries-old livelihood without any alternate plan. 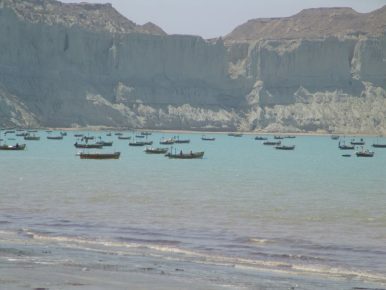 Beginning in October of 2018, the fishermen of Gwadar held several press conferences and strikes to protest the construction of the new highway. During Prime Minister Imran Khan’s recent visit to Gwadar on March 29, in a massive ceremony for the groundbreaking of the new Gwadar International Airport under CPEC, the fishermen’s hopes were raised. Khan assured “inclusive development,” where no harm will be caused to the livelihood of the fishermen. While the prime minister announced three bridges at the East Bay to ease access for fishing boats, the fishermen say it is not all they had been speaking out for. After the first wave of protests from October to December, the fishermen were aware of the fact that no matter how much they protested, this speedy construction work will not stop. To be more relevant, they put forward few demands. These included the construction of three underpass access points, each 200-foot (61 meters) wide, at Dohria, Gazrawan, and Baloch Ward — Gwadar’s three main fishing neighborhoods. Along with this, they also demanded a 1,500-meter long and 800-meter wide breakwater to safely berth their boats, an auction hall to sell fish, a protection wall at Sur Banden to avoid more land erosion, scholarships for higher studies for the children of fishermen, job opportunities at the port, and a resolution in the Balochistan Assembly for the protection of fishermen’s rights. After several strikes and a massive march by the fishermen in December, finally the officials from Gwadar Port Authority and the provincial government held negotiations with the fishermen’s representatives. The month-long strike was then called off on December 31, following a claim by the authorities that they had accepted all the demands, even though doubts were raised by many over the government stance. Suspicions became realities when instead of a 200-foot wide underpass, which the fishermen demanded, they were shown a model of a 20-foot wide underpass in January in presence of the Pakistani and Chinese officials. “The narrow underpasses will not allow easy access to the sea especially to the larger boats and it was not what we had demanded,” says Khuda Dad Wajo, fishermen representative in Gwadar. When the fishermen rejected the model, the authorities promised to take prompt action and work on the demands. Despite this, the construction work of the expressway continued without any of the demands met. The fishermen had already begun to perceive the work as less in their favor and more of a deception. As a result, in mid-February the fishermen started their sit-in protest once again and marched toward the local administrative offices on March 21 to protest the construction work. A large number of social activists and representatives of political parties also joined the march, which concluded with another promise by the deputy commissioner of Gwadar to take the issue to the higher authorities. This also furthered another process of negotiation between the fishermen representatives and the government authorities during a meeting in deputy commissioner office after the march. Meanwhile, on March 25, during their visit to Gwadar, Balochistan’s chief minister and the federal minister for planning, development and reform pledged they would resolve the issues of local communities. And now the prime minister’s visit and promises raised hopes and doubts at the same time. Have the issues of indigenous population in Gwadar really come to an end after the recent negotiations and promises or is it just the beginning? Only time can tell, but if people living in this natural port town are not consulted before “development” and if what they believe are their valid concerns or rights as centuries-old owners of the their land and sea are not heeded, such protests might continue.